When things go wrong and we’re pushed to the brink, the smaller, weaker ones suffer first. It’s a trickle down effect familiar to victims of spousal, elder, child or animal abuse. The same trickle down effect can ripple out in a positive way with acts of kindness and compassion. It’s why I believe the best way to help animals but especially pets is by teaching children responsible pet ownership. It’s wonderful to see kids volunteering at pet adoption events and learning about cat care. Not all kids have nurturing parents to help grow compassion but we all can play a part. You never how small act of thoughtfulness may have saved a life. It means speaking up and intervening if a child is being mean to any creature. Excellent resource on teaching kids empathy and compassion. 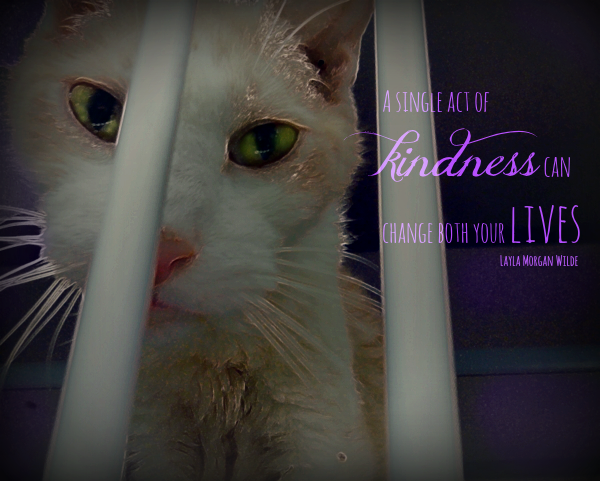 It’s why no matter what is going on, try to show kindness toward the animals. I get it. Some days are hard. On those days, I could use a boost of inspiration. 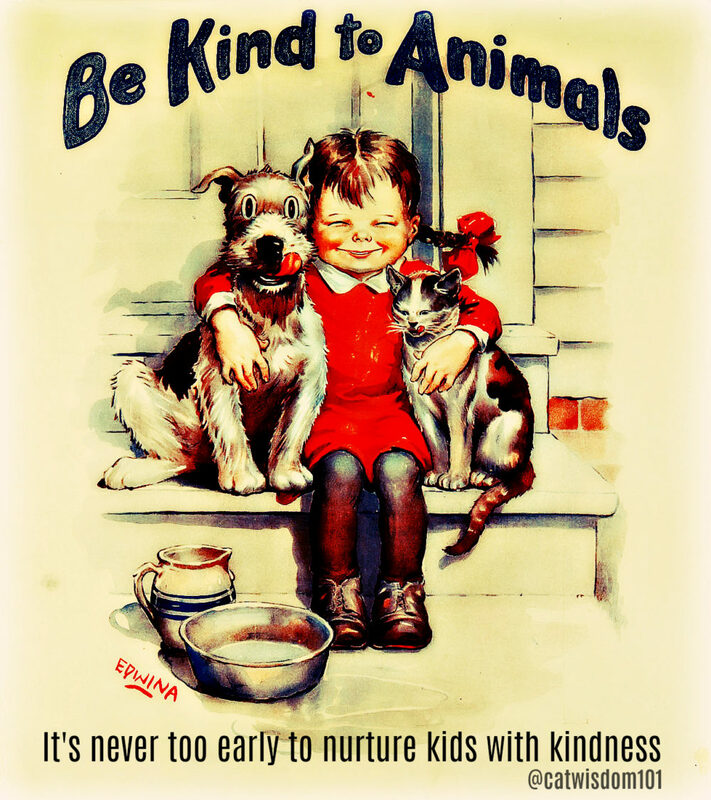 These are my favorite nine quotes about kindness to animals. Which one is your favorite? Odin reminds me of the duality of nature. Earlier, he’d smugly pranced around after killing a mouse. Then sleeping like an angel and probably dreaming of more hunting. 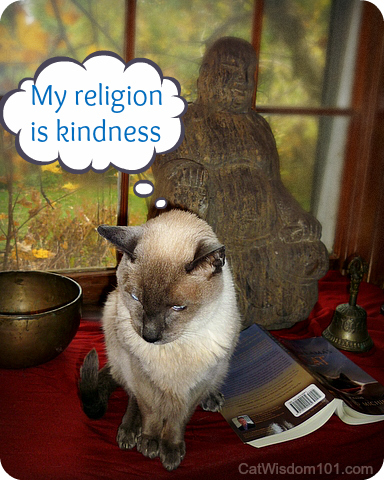 I’m not crazy about it but cats are hard-wired to hunt and kill so I accept and always treat him with kindness. Humans have evolved from caveman killers and no longer need to hunt. We have the choice to be kind or cruel. To be thoughtful or thoughtless in everything we do. 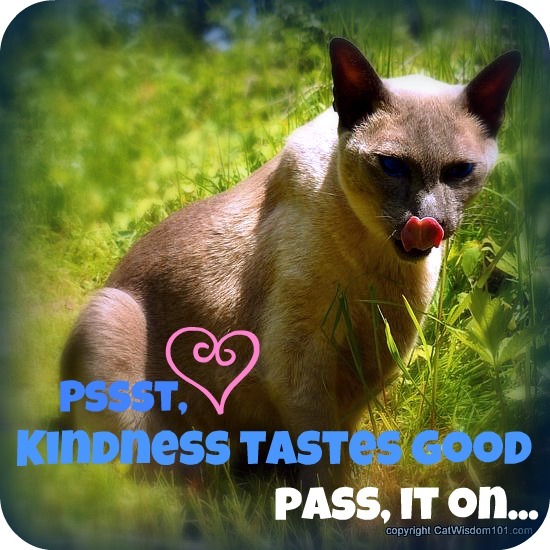 I’ve selected a few favorite vintage kindness quotes from our archive. Share and enjoy! 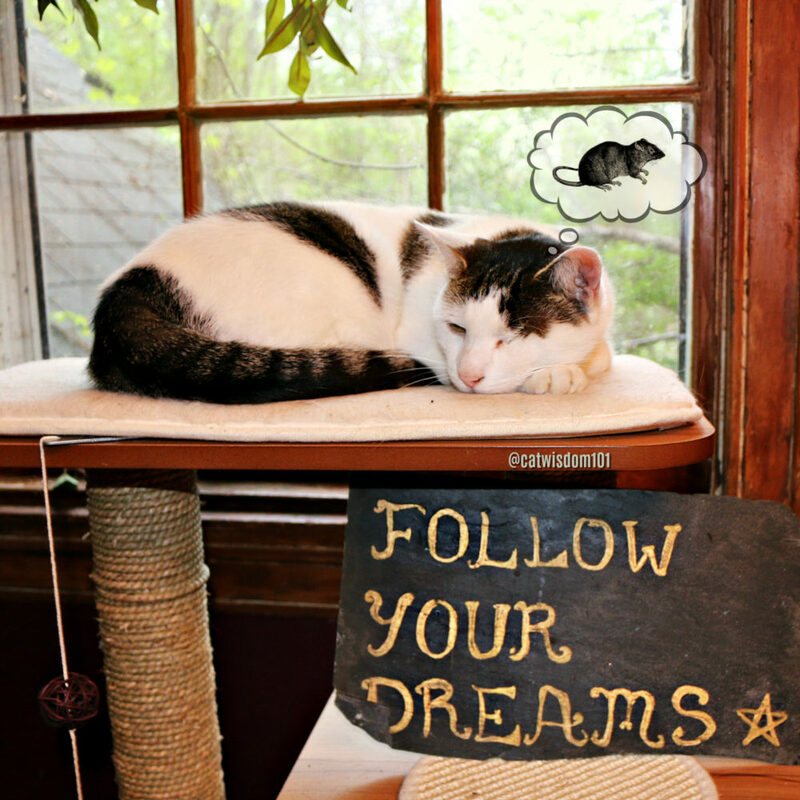 The late great Merlin and inspiration behind Cat Wisdom 101. Merlin on tongue out Tuesday in 2012. 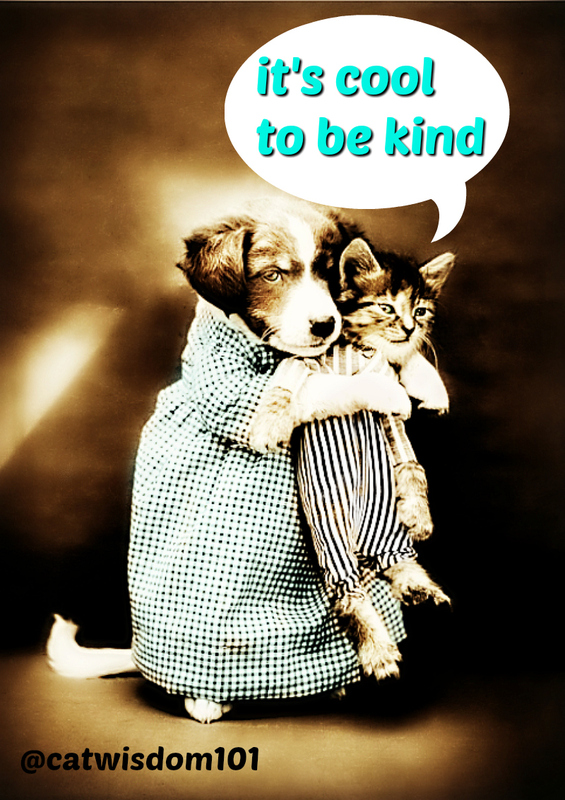 Recent studies prove being kind makes us happier. #bekindtocats. A cat rescued from a hoarder. I am glad that I found your post; it is a wonderful blog post which contains precious knowledge for all. Thanks for sharing. Keep it up. Beautiful quotes. Kindness travels long ways when it is well practiced. We love the quotes. Kindness is essential and so is compassion and empathy. I wish the person that hit and killed my baby Shadow in the early hours on 5/4/18 knew what those words meant. I am so done with about 80% of the human species. I would so rather live in a world with only animals as to live in one with only humans. Love the quotes……….animals give us SO MUCH, the very VERY least we can do is return the favor. They are all great quotes and show where man has failed or been enlightened. 6 & 7 resonate with me the most. Being kind makes us happy. <3 <3 <3 a thousand million luvs. I agree with all. Shaw, Herriot, Einstein. A brilliant writer, a vet and a certified genius. I had been thinking along similar lines this week, as I noticed how much less stressed I am in my new surroundings with Ched and sans hubs. 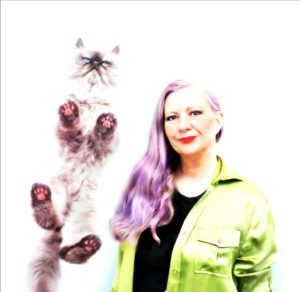 I am kinder to the writers whose articles I copy edit, because everybody needs kindness.. These are great quotes. I am glad my great niece has pets and is learning to be gentle.